Per-Arnt-Sim kinase (PASK) is a nutrient-regulated domain-containing protein kinase previously implicated in the control of insulin gene expression and glucagon secretion. Here, we explore the roles of PASK in the control of islet hormone release, by generating mice with selective deletion of the Pask gene in pancreatic beta or alpha cells. Floxed alleles of Pask were produced by homologous recombination and animals bred with mice bearing beta (Ins1 Cre; PaskBKO) or alpha (Ppg Cre [also known as Gcg]; PaskAKO) cell-selective Cre recombinase alleles. Glucose homeostasis and hormone secretion in vivo and in vitro, gene expression and islet cell mass were measured using standard techniques. Ins1 Cre-based recombination led to efficient beta cell-targeted deletion of Pask. Beta cell mass was reduced by 36.5% (p < 0.05) compared with controls in PaskBKO mice, as well as in global Pask-null mice (38%, p < 0.05). PaskBKO mice displayed normal body weight and fasting glycaemia, but slightly impaired glucose tolerance, and beta cell proliferation, after maintenance on a high-fat diet. Whilst glucose tolerance was unaffected in PaskAKO mice, glucose infusion rates were increased, and glucagon secretion tended to be lower, during hypoglycaemic clamps. Although alpha cell mass was increased (21.9%, p < 0.05), glucagon release at low glucose was impaired (p < 0.05) in PaskAKO islets. Francesca Semplici and Gabriela da Silva Xavier contributed equally to this study. The online version of this article (doi: 10.1007/s00125-016-4025-1) contains peer-reviewed but unedited supplementary material, which is available to authorised users. Type 2 diabetes affects approximately one in 12 of the adult population  and usually involves changes in both insulin secretion  and insulin action . Acting on the healthy pancreatic beta cell, elevated blood glucose concentrations lead to increased glucose flux across the plasma membrane, mediated by the transporter GLUT2 (plus GLUT1 in humans) , glucose phosphorylation catalysed by glucokinase, and enhanced glycolytic flux to fuel the citrate cycle . Increased mitochondrial metabolism , ATP synthesis  and the closure of ATP-sensitive K+ channels  cause plasma membrane depolarisation, Ca2+ influx via voltage-gated channels (L-type) , the further activation of mitochondrial metabolism , and secretory granule exocytosis . In addition, ATP-sensitive K+ channel-independent mechanisms potentiate the actions of Ca2+ via mechanisms that are presently poorly understood . The signalling pathways controlling glucagon secretion are less well defined and may involve a more dominant role for neural and hormonal control , as well as the cell-intrinsic actions of glucose. Enhanced ATP synthesis , ATP-sensitive K+ channel closure and the opening of T-type Ca2+ channels , and ATP-dependent effects on intracellular Ca2+ stores may also be involved . Fuel-sensing kinases such as AMP-activated protein kinase  have previously been implicated in the control of both insulin [18, 19] and glucagon secretion [20, 21]. Originally cloned in 2001 by Hofer and colleagues  and, separately, by Rutter and colleagues , Per-Arnt-Sim (PAS) domain-containing protein kinase (PASK, also known as PASKIN) is a member of the nutrient-regulated protein-serine kinase family and the only PAS domain-containing member of this group expressed in mammalian cells . In Saccharomyces cerevisiae there are two PASK orthologues: Psk1 and Psk2. Under cell wall stress conditions these enzymes phosphorylate the metabolic enzyme uridine diphosphate-glucose pyrophosphorylase to mobilise glucose . Importantly, the PAS domain of the mammalian enzyme is potentially targetable by small molecules and as such may offer an attractive target for therapeutic intervention in some forms of diabetes . Implying a potentially important role for PASK in regulated insulin secretion, we showed in 2004 that PASK is required in clonal pancreatic beta cells for normal proinsulin gene expression . Subsequently, Rutter and colleagues  demonstrated a role for PASK in mammalian glucose homeostasis by showing that mice deleted globally for the enzyme displayed improved insulin sensitivity but impaired insulin secretion in vivo and from isolated islets. We have also shown that activating mutations in the human PASK gene modulate insulin secretion . However, subsequent studies  revealed little effect of global Pask deletion in mice on in vivo insulin secretion, but a profound effect on total pancreatic insulin content, consistent with a role for PASK in insulin gene expression [26, 29, 30] and insulin protein stability . Glucagon release was enhanced in this model . The impact of tissue-selective deletion of conditional Pask alleles has not hitherto been explored, restricting our understanding of the role of the kinase in glucose homeostasis in vivo. Here, we describe the generation of floxed alleles of the kinase and explore the impact of its deletion from pancreatic beta or alpha cells. Whereas fasting and fed insulin levels and glucose-stimulated insulin secretion were not affected by Pask deletion under most conditions, beta cell mass was significantly (36.5%) reduced in beta cell-selective null animals (PaskBKO). On the other hand, alpha cell-selective deletion (PaskAKO) led to impaired glucagon secretion in vitro and in vivo. These findings demonstrate the importance of PASK for the normal development and function of the beta and alpha cell, respectively. Mice carrying conditional null alleles of Pask (Pask fl/fl ) were generated by insertion of loxP sites flanking exon 11 and exon 15, which encompass the Ser/Thr kinase domain, through homologous recombination (see electronic supplementary material [ESM] Methods, ESM Fig. 1a–c). Pask fl/fl mice were crossed with animals expressing Cre recombinase under the control of the insulin 1 promoter (Ins1 Cre mice ) or with mice expressing Cre under the control of the glucagon promoter (Ppg Cre mice ) to achieve deletion in pancreatic beta cells (PaskBKO) or in pancreatic alpha cells (PaskAKO). PaskBKO mice were born at the expected Mendelian ratios. PaskAKO mice were born at the expected Mendelian ratios only if assuming that the Cre transgene had co-localised on the same chromosome (chromosome 1) as the Pask floxed gene. Genotyping was performed by PCR using DNA from ear biopsies. Ablation of Pask gene expression from pancreatic islets was assessed by quantitative real-time PCR (qPCR) on cDNA reverse-transcribed from islet RNA, as described below. All mouse strains were maintained on a C57BL/6 background. Mice with global deletion of Pask  were gifts from R. Wenger (University of Zürich, Zürich, Switzerland). Animals were housed in groups of two to five per individually ventilated cage in a pathogen-free facility with a 12 h light/dark cycle and were fed ad libitum with a standard mouse chow diet or a high-fat diet (60% wt/wt fat content; Research Diets, New Brunswick, NJ, USA). Where indicated, 8-week-old mice were transferred on to a high-fat diet for a period of 12 weeks. All in vivo procedures described were performed at the Imperial College Central Biomedical Service and approved by the UK Home Office according to the UK Animals (Scientific Procedures) Act 1986 (PPL 70/7349 and PPL 70/7179). In vivo physiology (IPGTT, in vivo glucose-stimulated insulin secretion, insulin tolerance tests, plasma glucagon, hyperinsulinaemic–hypoglycaemic clamps), RNA extraction and qPCR, islet isolation and hormone secretion, and beta and alpha cell mass measurements are described in ESM Methods. Blood was collected at indicated time points and plasma insulin was measured by ELISA (Mercodia, Uppsala, Sweden). Total cellular RNA was extracted from mouse islets or other tissues and converted to cDNA for qPCR. Alpha and beta cell mass was assessed in pancreases from 20-week-old mice. Anti-PASK antibody (PA5-29309; Pierce, Rockford, IL, USA) was used in immunohistochemical analysis. Experimenters were blinded to the group assignment for assessment of islet cell mass. Samples were not randomised. No data, samples or animals were excluded. Data are expressed as means ± SEM. Significance was tested by unpaired or paired two-sample Student’s t tests using Excel, or by ANOVA using GraphPad 4.0 (La Jolla, CA, USA). A value of p < 0.05 was considered significant. Breeding of mice with floxed Pask alleles with animals expressing Cre recombinase under the control of the Ins1  or Ppg gene promoter  was predicted to lead to recombination selectively in pancreatic islet beta (PaskBKO) or alpha (PaskAKO) cells, respectively. Correspondingly, Pask mRNA levels, assessed by qPCR, were reduced by >75% in PaskBKO mouse islets vs controls (Fig. 1d, left), with concomitant reduction in beta cell PASK protein content, as assessed by immunohistochemistry (Fig. 1e). No change in Ins2 mRNA levels (Fig. 1d, right) was detected in the same islets. By contrast, differences in Pask mRNA could not be detected between PaskAKO and wild-type (WT) islets (not shown), likely reflecting the low abundance of alpha cells in rodent islets (~20% of all cells)  and expected 20–50% deletion with the Ppg Cre used here . Correspondingly, in PaskAKO islets, immunohistochemical analysis revealed a 42.6 ± 17.5% overlap of the signal from anti-PASK antibody with that from glucagon antibody, whereas this value was close to 100% in WT islets (Fig. 1f). Measured in male mice at 8 and 20 weeks of age, PaskBKO animals on a normal chow diet displayed normal weight gain (Fig. 2a) and normal glucose homeostasis during IPGTT compared with WT littermates (Fig. 2b, c). Both in vivo (1 g/kg; Fig. 3a, b) and in vitro (Fig. 3c) glucose-stimulated insulin secretion were unaffected by the deletion of Pask. In order to provide a metabolic stress on the beta cell, where effects of Pask deletion might become apparent, we challenged PaskBKO mice with a high-fat diet for 12 weeks. Weight gain between WT and null mice was not significantly different (Fig. 2d). PaskBKO animals exposed to a high-fat diet had an elevated glucose peak during IPGTT compared with WT littermates (Fig. 2e), although no significant differences in AUC for glucose excursions (Fig. 2e) or plasma insulin (Fig. 3a, b) were observed. The above observations suggested that beta cell function or mass may be affected by Pask deletion. Since a beta cell phenotype may be masked or compensated for in vivo, we further investigated this in detail by performing in vitro experiments and by quantifying islet mass. To explore the latter possibility, optical projection tomography or immunohistochemistry were undertaken and revealed a 36.5 ± 1.2% (Fig. 4a–d) and a 38 ± 1.93% (Fig. 4e) decrease in beta cell mass in PaskBKO and global Pask-null mice, respectively. In PaskBKO animals, this reflected both increases in the number of smaller, and decreases in the number of larger, islets (Fig. 4d). Interestingly, after maintenance on a high-fat diet, we observed a similar decrease in beta cell mass (Fig. 5c), as well as a near-complete elimination of Ki-67 staining, in beta cells of PaskBKO vs WT islets (Fig. 5a, b and d), indicating impaired proliferation under these conditions. Fed plasma insulin levels were, nonetheless, unchanged in this model (Fig. 5e). Immunohistochemical analysis revealed a 47.4 ± 0.7% decrease in alpha cell mass in global Pask-null mice (Fig. 4g). Whilst no significant changes in beta cell mass were observed in PaskAKO mice (Fig. 6a–c), a 21.9 ± 4.6% increase in alpha cell mass was detected in PaskAKO vs WT mice (Fig. 6d). Male PaskAKO mice on a normal chow diet or a high-fat diet showed no significant differences in weight gain or glucose tolerance between 8 and 20 weeks (Fig. 2f–j). We performed hyperinsulinaemic–hypoglycaemic clamps to explore the impact of deleting Pask in the alpha cell on in vivo glucagon production. Strikingly, upon insulin infusion, the decrease in glycaemia was more rapid in PaskAKO animals vs WT mice, with the former reaching 0.5 g/l at around 40 min compared with 60 min in controls (Fig. 7a). Furthermore, during the time period 60–120 h, when glycaemia was similar in both groups (around 0.5 g/l), it was necessary to infuse more glucose in PaskAKO mice, confirming a likely lack of counterregulatory response in these mice (Fig. 7b). Although a small but significant increase in glucagon levels was apparent prior to the onset of the glucose clamps (Fig. 7c), glucagon release at 120 min displayed a strong tendency towards a lowering in the knockout mice (Fig. 7c). Similarly, glucagon secretion from isolated islets was significantly reduced in response to low glucose (Fig. 7d). By contrast, we observed no differences in insulin tolerance between mice of either genotype in vivo (Fig. 7e). We provide here the first description of mice deleted highly selectively for Pask in the pancreatic alpha or beta cell. We were able to demonstrate a robust lowering of Pask expression in islets in both PaskBKO and PaskAKO mice, reflecting the expected efficiency of the Ins1 Cre deleter strain (found to recombine in >94% of beta cells, with no significant off-target recombination in other cell types) [32, 36] and the Ppg Cre strain (which recombines in 20–50% of alpha cells) . Whilst insulin secretion from islets was previously shown to be defective in global Pask-null mice , our own studies with this model  indicated that the stimulation of insulin release was normal. However, Ins2 and Pdx1 gene expression were both substantially lower in knockout islets, and the pancreatic content of the hormone was sharply reduced . In the present study using the Ins1 Cre line [36, 38] to inactivate Pask in the beta cell, we did not detect decreases in insulin mRNA measured per islet, but did observe a significant lowering of beta cell mass throughout the pancreas (Fig. 4c, d), which was paralleled by decreased Ki-67 immunoreactivity when measured after a high-fat diet (Fig. 5a–d). Furthermore, in vivo measurements of insulin revealed no significant decreases in plasma insulin following an IPGTT in PaskBKO mice when measured at 13–15 weeks (Fig. 3a, b), although there was a tendency towards lowered plasma insulin when measured between 16 and 20 weeks (data not shown). By contrast, global Pask-null mice displayed both decreases in beta cell mass (Fig. 4e) and in vivo insulin secretion (Fig. 4h). The reason(s) for the modest effect of beta cell-specific elimination of PASK, in contrast to findings in the global Pask-null mouse here and in earlier reports [26, 29, 30, 31], is unclear. However, these results may suggest that changes in the global Pask-null mice reflect either (1) a requirement for PASK during the development of beta cell progenitors, and/or (2) the downstream consequences of Pask deletion elsewhere in the body, possibly including the brain . With respect to the first, Semache and colleagues  have previously reported that PASK regulates the stability of pancreatic duodenal homeobox 1, a key regulator of the insulin gene , which might be expected to restrict beta cell development and may underlie an observed decrease of ~37% beta cell mass in the PaskBKO mouse found here. Of note, such a decrease is not expected to induce glucose dyshomeostasis, given that the destruction of 50% of beta cells is without effect in mice . 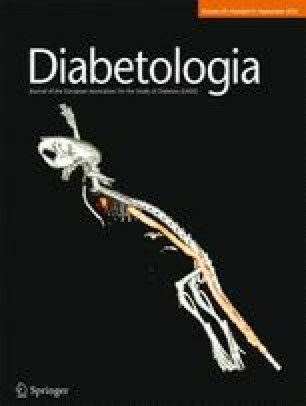 Thus, impaired glucose intolerance in PaskBKO mice after a high-fat diet is likely to reflect additional changes to pancreatic beta cell function and glucose sensing. Our previous findings  pointed to a role for PASK in the control of glucagon secretion. Here, we demonstrate this role in vivo after selective deletion from the alpha cell population. Unexpectedly, whilst we confirmed our previous finding of enhanced basal release of the hormone in global Pask-null mice (Fig. 7c), suggesting that PASK restricts glucagon release at normal levels of glycaemia, we now demonstrate that PASK is required for the stimulation of glucagon release during hypoglycaemia. Thus, glycaemia was lowered more rapidly in response to insulin infusion in PaskAKO mice than in controls, despite higher glucose infusion rates (Fig. 7). Of note, these changes were apparent despite deletion in 57.4% of alpha cells with the Cre deleter strain used here [21, 37]. Given the observed decrease in alpha cell mass of ~47% in the global Pask-null mouse (Fig. 4g), we hypothesised that decreases in alpha cell number may contribute to impaired glucagon production in PaskAKO mice. However, PaskAKO mice displayed an increase in alpha cell mass (Fig. 6d), indicating that alpha cell dysfunction is likely to be the major contributor to the phenotype displayed by PaskAKO mice. The reasons for the differences in the impact on alpha cell mass of global vs cell type-specific Pask deletion are unclear. Furthermore, the above findings are in contrast to earlier observations with global Pask-null animals , in which fasting glucagon levels were higher in Pask-null mice than in WT mice, and the ability of high glucose to suppress glucagon secretion was impaired in islets from the former. What may underlie these differences? Again, actions of the kinase at extrapancreatic sites (such as liver, adipocytes and brain) are one possibility, whilst a role for PASK in restricting the production of alpha cell progenitors, mooted above, may provide an alternative explanation. In support of this idea, alpha cell mass was decreased in global Pask-null mice (Fig. 4g). Alpha cell function is also regulated through insulin secretion by neighbouring beta cells and it is therefore conceivable that the effects on glucagon secretion observed in the whole-body knockout mice may reflect a combination of defects in all pancreatic cell types in this model that are not replicated in the present cell type-specific models. It is currently unknown, for example, whether PASK has any function in pancreatic delta cells, although somatostatin is a regulator of both alpha and beta cell function . Nevertheless, the present results demonstrate a clear and cell-autonomous role for PASK in the acute control of glucagon secretion (Fig. 7c, d) and beta cell mass (Fig. 5). The precise molecular mechanisms through which the kinase acts will need further exploration, and possibly the generation of mice bearing selectively-labelled alpha cells to permit studies at the single cell level . The present findings indicate that PASK plays critical roles in the biology of both pancreatic beta and alpha cells in vivo. However, we reveal striking differences between the glycaemic phenotype of animals deleted globally for the kinase vs the cell type-specific knockouts, demonstrating likely important roles for tissue interactions or actions at early developmental stages. We thank M.-S. Nguyen-Tu for help with OGTTs, and A. Martinez-Sanchez for proofreading the manuscript. The study was funded by grants to GAR from Diabetes UK (Project BDA 11/0004210), the Wellcome Trust (Programme 081958/Z/07/Z; Senior Investigator Award WT098424AIA), and the MRC (UK; Project GO401641; Programme MR/J0003042/1). GdSX thanks Diabetes UK (BDA 13/0004672) and the European Foundation for the Study of Diabetes–Merck Sharp and Dohme for project grants. The work leading to this publication also received support from the Innovative Medicines Initiative Joint Undertaking under grant agreement no. 155005 (IMIDIA) (GAR, CM, PLH), resources of which are composed of financial contributions from the European Union's Seventh Framework Programme (FP7/2007–2013) and the European Federation of Pharmaceutical Industries and Associations. KM-B, AP-K, SB, AR and AM are employees of AstraZeneca. The remaining co-authors declare that there is no duality of interest associated with their involvement in this manuscript. GAR and GdSX conceived the project and co-wrote the article with FS. KM-B, AP-K, SB, AR and AM generated the floxed mouse line. PLH provided the Ppg Cre mice and co-designed the strategy to generate and genotype the PaskAKO transgenic line. FS, AM, HS and GdSX generated and genotyped the conditional knockout mice, and performed IPGTTs, gene expression analysis, and insulin and glucagon secretion assays. JMG, PF, BM, RY, AM and GdSX performed immunohistochemical and optical projection tomography analysis. CM, SM-L, and EP performed hypoglycaemic clamps, and JL and JG the glucagon assays. All authors were involved in drafting the article or revising it critically, and all authors gave final approval of the version to be published. GAR is the guarantor of this work.